AAR produced an entirely new car for 1972, based in some part on the successful McLaren M16, and it proved to be the quickest car of the season. Bobby Unser took pole position six times in nine races. The McLaren M16Bs were more numerous - a pair for Penske and a pair for McLaren Cars - but could not quite match the speed of new Eagles. The third of the competitive cars was the new Parnelli VPJ1 designed by Maurice Philippe and built by chief crew George Bignotti for the "superteam" of Al Unser, Joe Leonard and Mario Andretti, the latter recruited from the defunct STP/Granatelli operation. Unser won four of the short track events but his Eagle was unreliable in the longer races and he finished well down in the title race. 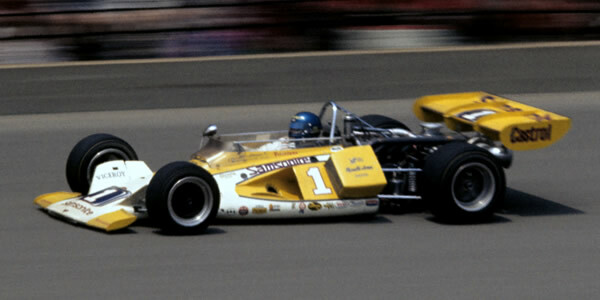 McLaren driver and early points leader Mark Donohue was sidelined mid-season by a testing accident and the Parnelli team took advantage, Joe Leonard winning three races in July and August. Leonard took a second successive title with the next places filled by Billy Vukovich in Jerry O'Connell's customer Eagle and Roger McCluskey's whose dismal season had been rescued when team owner Lindsey Hopkins acquired a second-hand McLaren.